Dawn attack was chosen as a first game of day 2 and I think it is very appropriate! 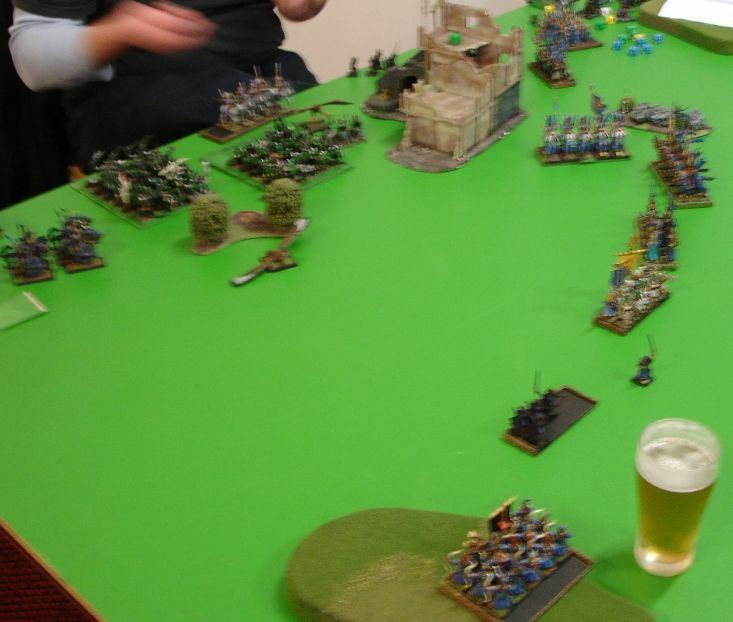 I was about to face Orcs and Goblins led by Chris. Greenskins are not very good match up for me. I haven't been able to play well against them so far although I was better equipped to fight trolls than last time. Chris surprised me with a themed army. He chose Grimgor Ard Boyz as a reference and although he didn't include that special character he built his army around that idea. Orc Great Shaman, Level 4 - Big Waaagh! Goblin Shaman, Level 2, Dispel Scroll - Little Waaagh! 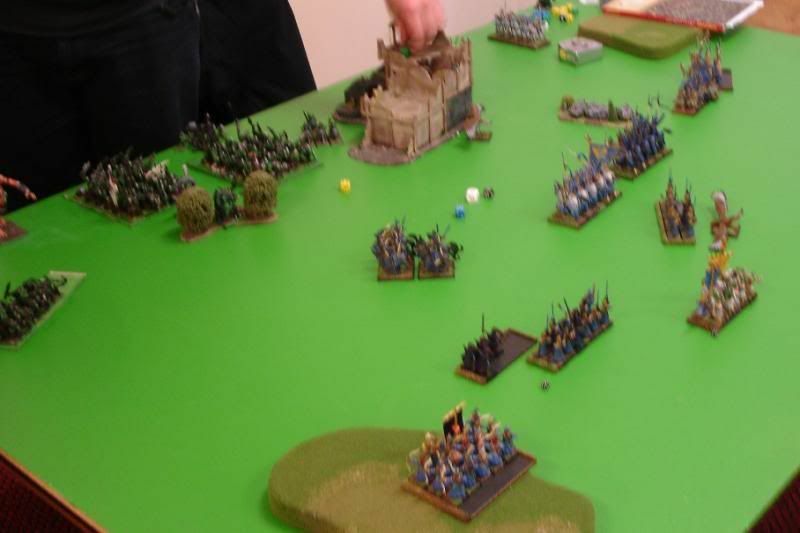 Quite old school army, with big blocks of infantry, nasty characters and some dangerous "support" units in the form of trolls and giants. I apologize for lack of details about the magic items. I am sure there were some ward saves here and there. The army was interesting also because it nicely countered the usual problems greenskin generals face. 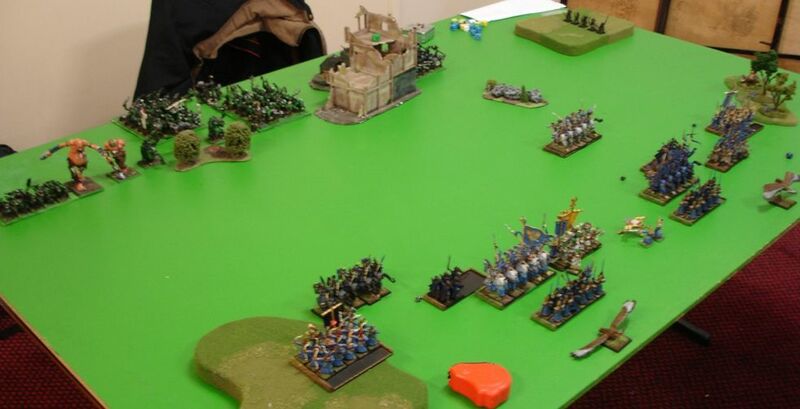 First, 3 blocks of Orcs were kind of immune to animosity. If that happened to non-black orcs, then there were black orc bosses to crush some skulls and restore order. Immune to psychology trolls as well as black orcs also were a good addition. On the other hand with a warboss and standard of discipline as well as bsb nearby, trolls were as smart as any other unit in the army if not better. Two shamen were a challenge for sure and a lot depended on the spells selection but in general I was definitely out-magicked. 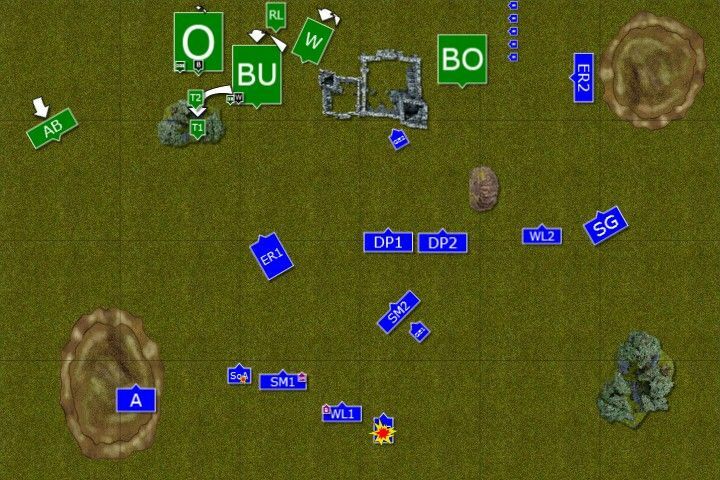 I won the roll-off and had to deploy my entire army first. Not knowing which flank Chris is going to choose (or will be forced to choose :)) I tried to deploy symmetrically and if possible in the center. 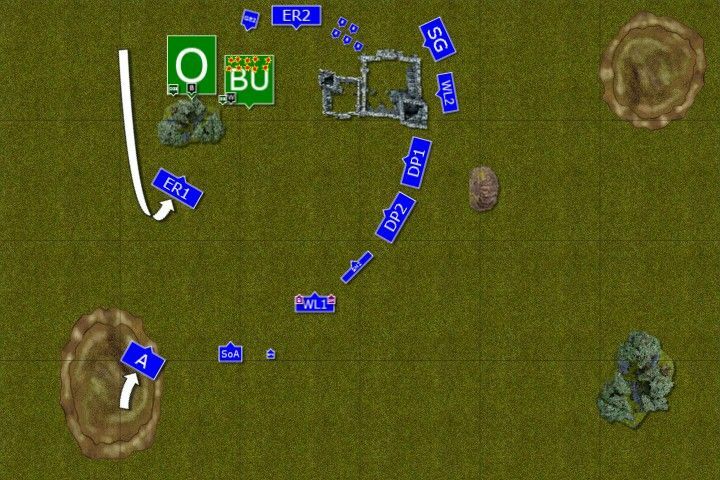 Thanks to that I hoped to keep flexibility to shift the units where I wanted them to be. The aim was to shoot at giants first and either kill them or wound them badly before they get into combat. Magic missiles were to help here as well. Also, since they are flaming I wanted to use them against trolls. Sisters would be quite important here as well. In general my shooting was to eliminate these single but very dangerous targets as soon as possible thus allowing me better maneuvering options. Obviously I wanted to match dragon princes against black orcs but again that could be more difficult to do, depending on the deployment. 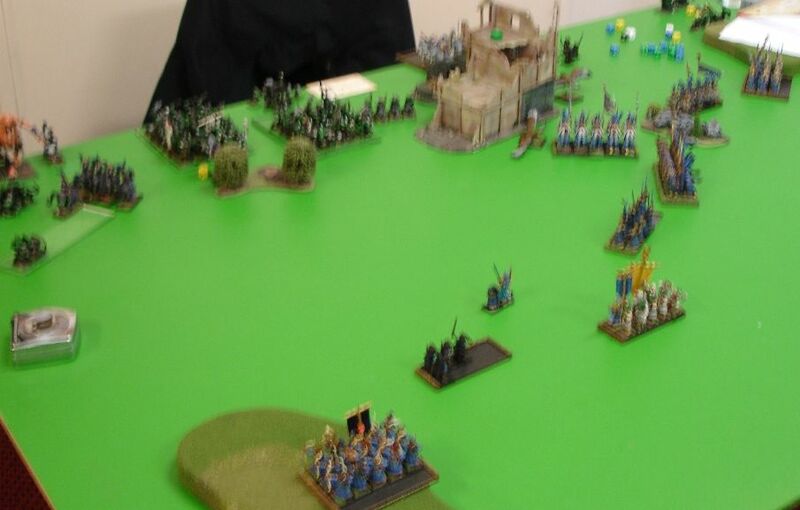 In the end I was close enough to be able to send cavalry against them but due to terrain it was not that easy to access that unit. The special rules didn't mess up much with our deployments. Archers and sea guard had to be deployed on respective flanks while some of the big boyz ending up on my left flank helped Chris to choose that wing to deploy his characters and respective units. Very good selection for Chris and very bad for me :) In particular, 'Eadbutt and Foot of Gork have a huge damage potential to my army. 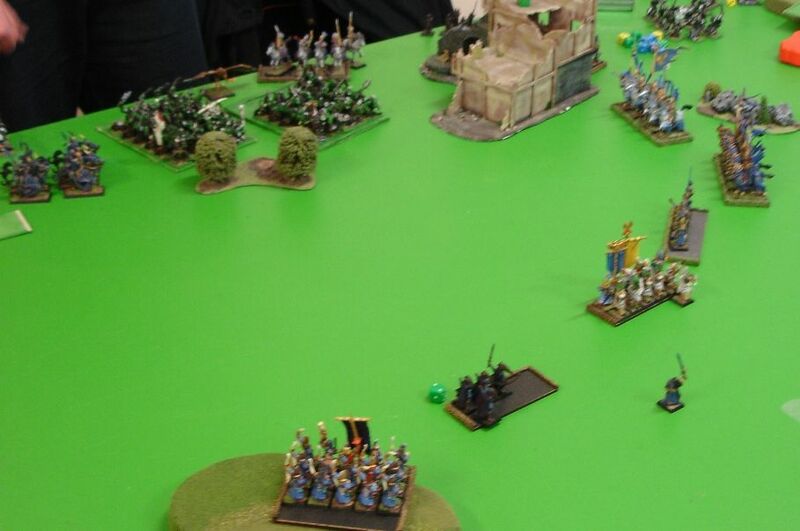 High Elves move quickly. 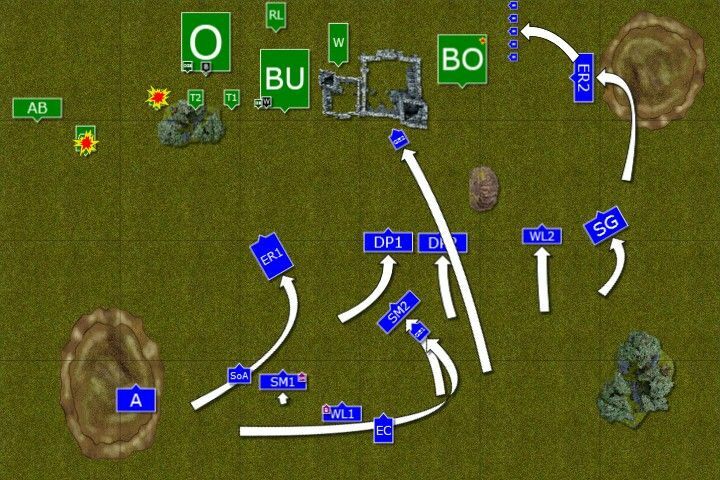 Regiments on the East close distance to black orcs defending the flank of their army and blocking the passage to the rear. 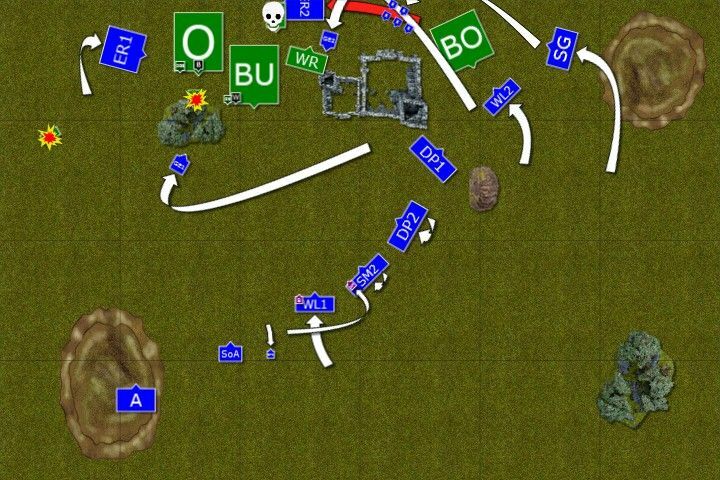 Some of the units shift towards the center to get into range or to get better position. Then the shooting starts and one of the giant is the only target for elven archery. With many arrows finding their marks the giant is badly wounded. Then Eagle Claw crew aims their war machine carefully and in a display of perfect shooting they finish off the huge brute. His twin brother is in turn affected by the spell that slows him down a little. 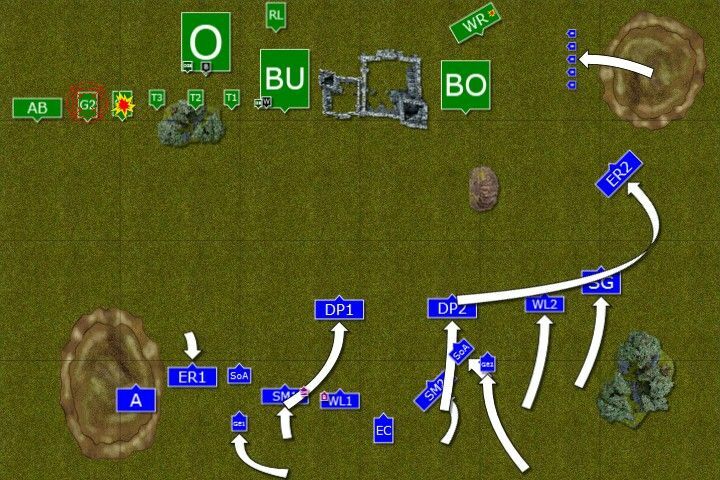 The greenskin army does not move forward at all, maintaining disciplined formation and not opening flanks for envelopment. Only giant moves towards the archers. Great Shaman summons the power of Gork (or maybe Mork) and a huge green foot stomps poor sisters to the bloody pulp. As well as shooting on the West! This time Larry the Loremaster aids his shooters and their combined effort sees another giant dead and looking like a pincushion as well as one of the trolls burned to ashes. 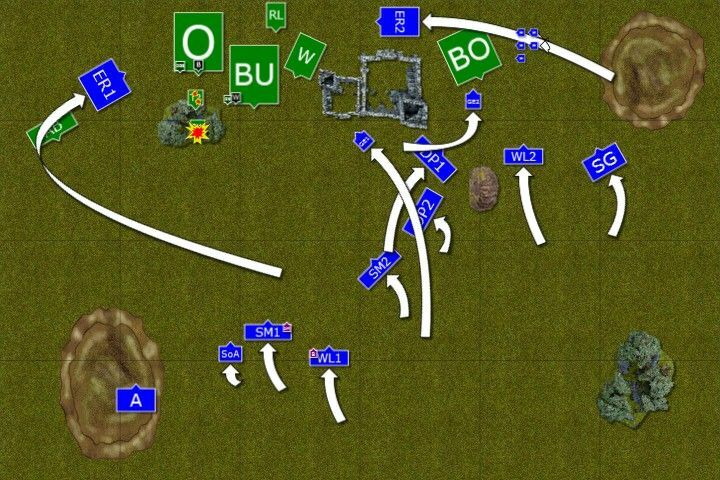 The rest of the regiments maneuver so that they are in safe distance from the big infantry units while trying to maintain the pressure on the greenskins. Rock Lobba hits the target! 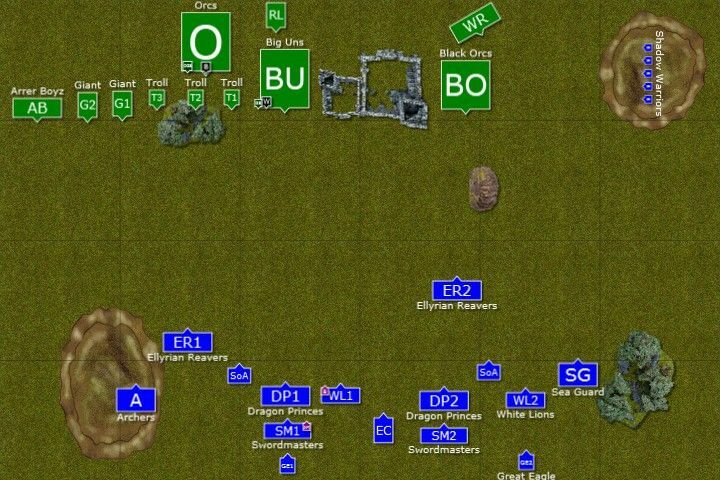 Yet again the Orcs army stays where it was. Magic this time is uneventful but rock lobba throws the boulder exactly on the eagle claw and fragile elven war machine is utterly destroyed. 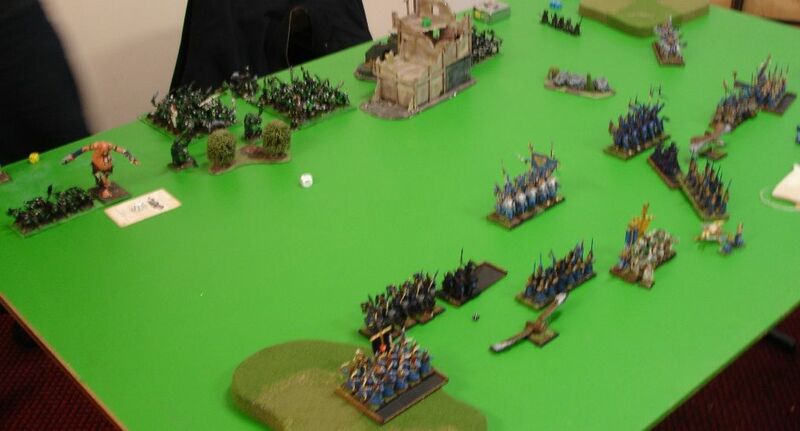 Ellyrian Reavers manage to get to the rear of enemy formation and speed up towards the rock lobba. 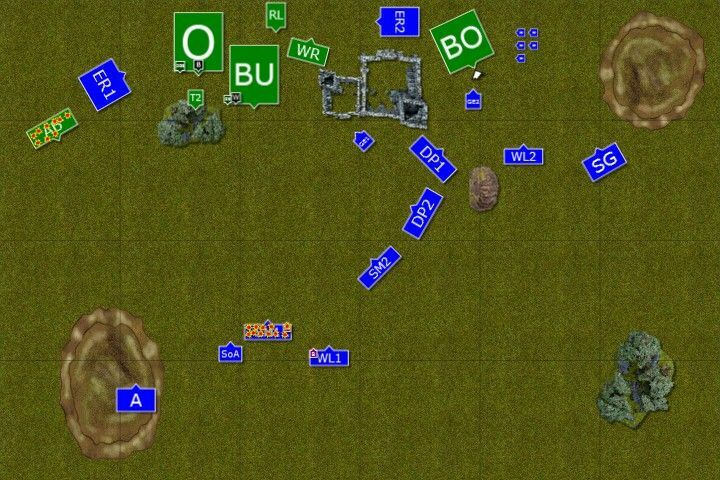 On the East 3 units close in and try to single out black orcs but it is not easy task due to nearby building. On the West the shooting continues. Another troll lies dead and the last one barely stands, his gnarled hide looking like a back of a hedgehog. It seems that Orcs decided not to fight at all this time and were content with a little rock throwing as well as magicking. Great Shaman tried to summon more powerful version of the spell and big green foot again stomped some elves, this time Swordmasters. Then something went wrong and the same foot stomped arrer boyz! Great Shaman, not disturbed by that at all, magically 'eadbutted the loremaster for good effect. 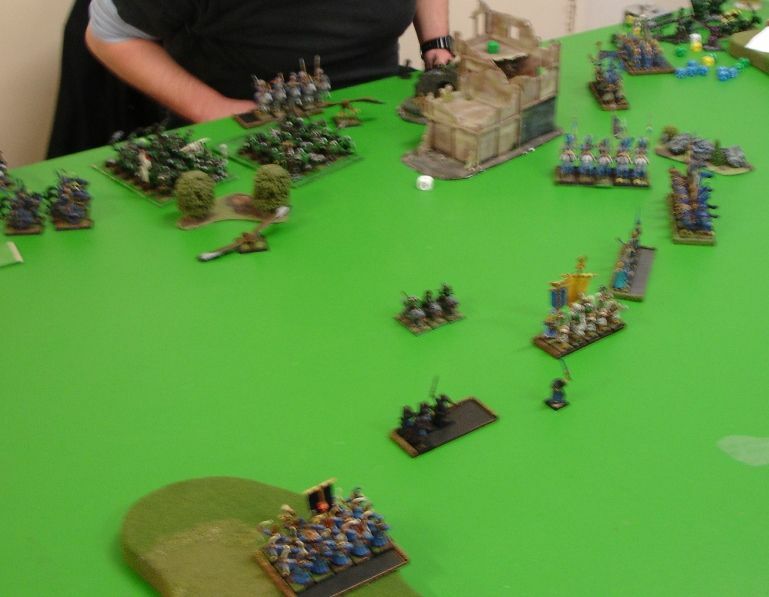 Arrer Boyz and Troll are finished off by merciless elven archers. 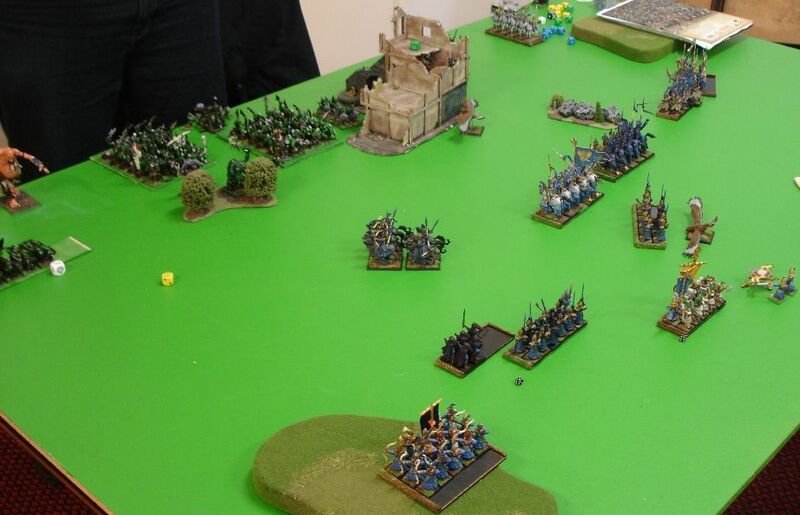 Ellyrian Reavers charge and destroy the Rock Lobba and reform to face wolf riders. 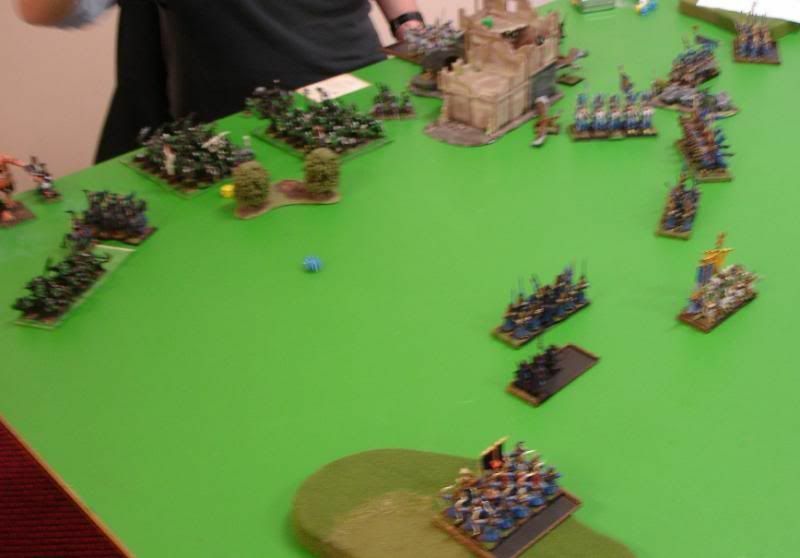 White Lions on the East expose themselves and bait black orcs while dragon princes and sea guard get ready for flank charges. Black orcs do not take the bait and do not move. The rest of the army also stays where it was. Only wolf riders try to hunt down the last swordmaster but they fail to hit him. Great Shaman is still unstoppable and another unit of Swordmasters suffers his wrath. 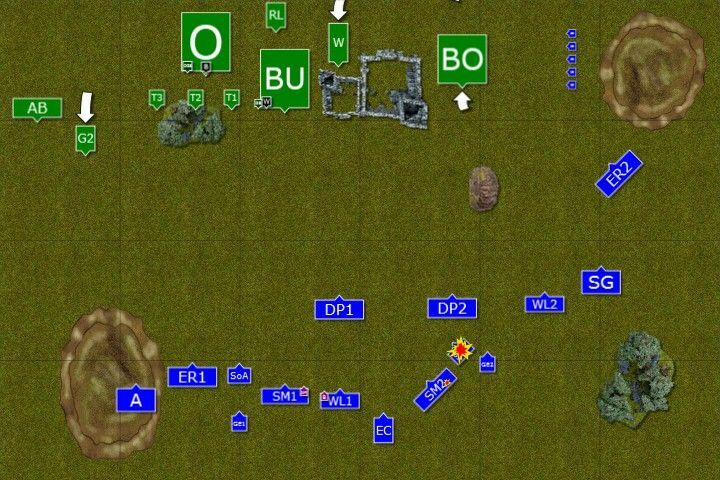 White Lions and Sea Guard charge from 2 directions at the same time and even might black orcs cannot hold against such a ferocious attack. They break and are caught in hot pursuit. Wolf riders are shot down with easy and even a great eagle charges in to hunt down small goblin shaman but black orc warboss intervenes in time to save his sidekick. Big 'Uns were visibly bored and that meant trouble. But Black Orc Warboss was a professional and his long military career gave him enough experience to squash any problems at the very first sight. A few ring leaders were now lying with their skulls open and the rest of the unit stood to attention, proud they are following such a talented officer. Great Shaman continued his magical duel and raw Waaagh! power proved to be too much for badly wounded loremaster and another 'eadbutt left him totally unconscious. His warriors took him away from the battle as quickly as possible. 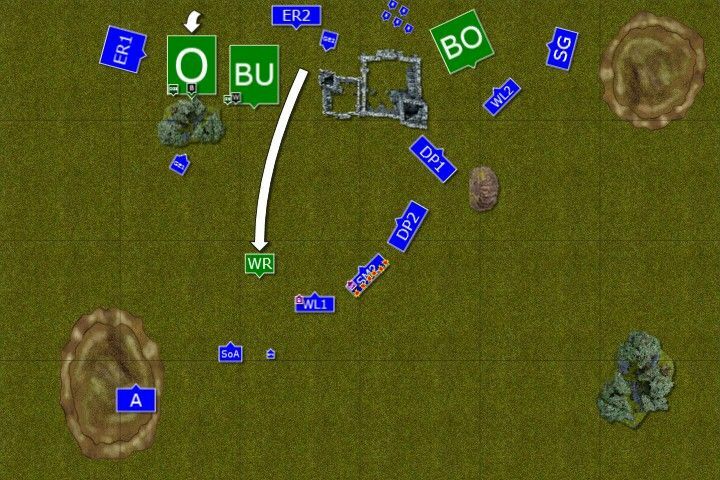 With only frontal charge as an option Elves decided to go for a safer mode and shot at the main regiment of the enemy. 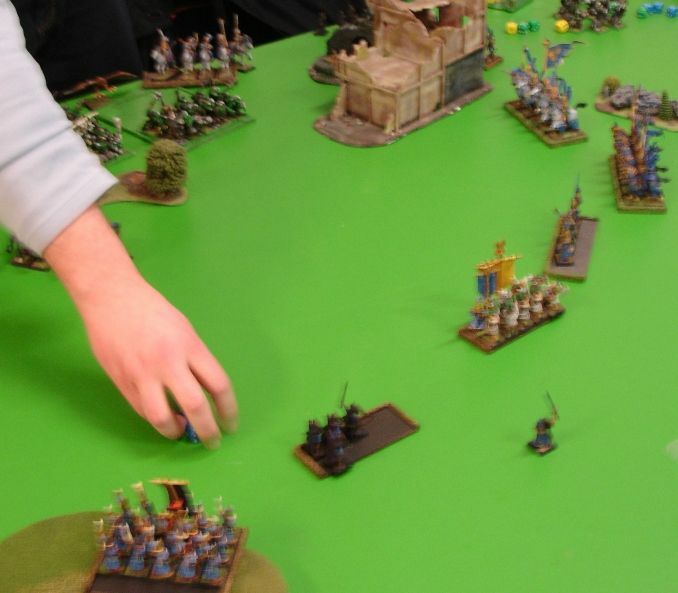 Although the arrows hit many Orcs and only 10 of them remained they didn't even think about withdraw as they feared their Warboss far more than the squishy Elves. With both armies energy spent even the Great Shaman could not muster any more power to cast more of his deadly spells. Content with the fact that his adversary was not present on the battle field any more he advised his Warboss to withdraw to get more boyz for the proper fight. Black Orc decided it is good idea, in particular when he looked at his own, now miserable unit. Thanks a lot, Chris, for a great game! It was a very interesting battle and we definitely had a lot of moments to laugh at. 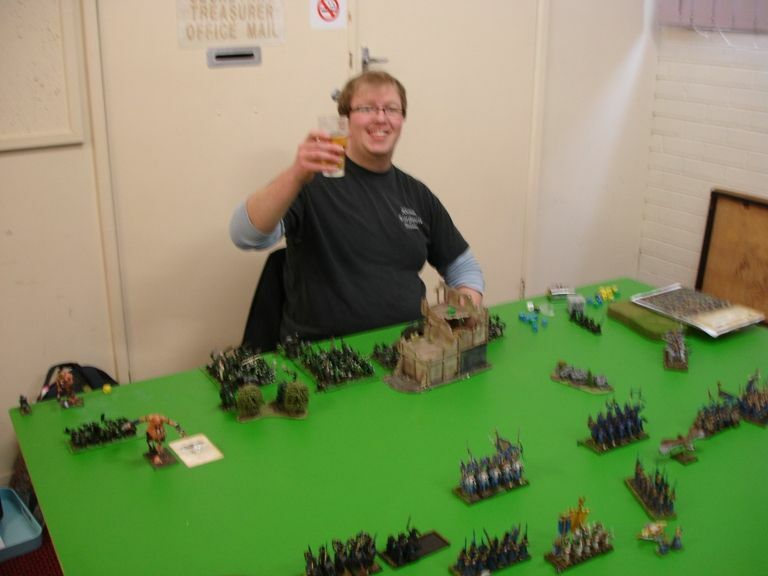 It was a pleasure to play against you and share a pint or two while we were at it! When we calculated the points it was 12-8 victory for me, which I was very happy with. While I was close to 13-7 and while the loss of the Loremaster was as always a major shift in the result, there were many things I was very glad that have worked. First of all shooting was simply amazing. I didn't expect it is going to be so efficient although I still think it was not that much over the top. It was simply another example how different effects of different units can be nicely combined. 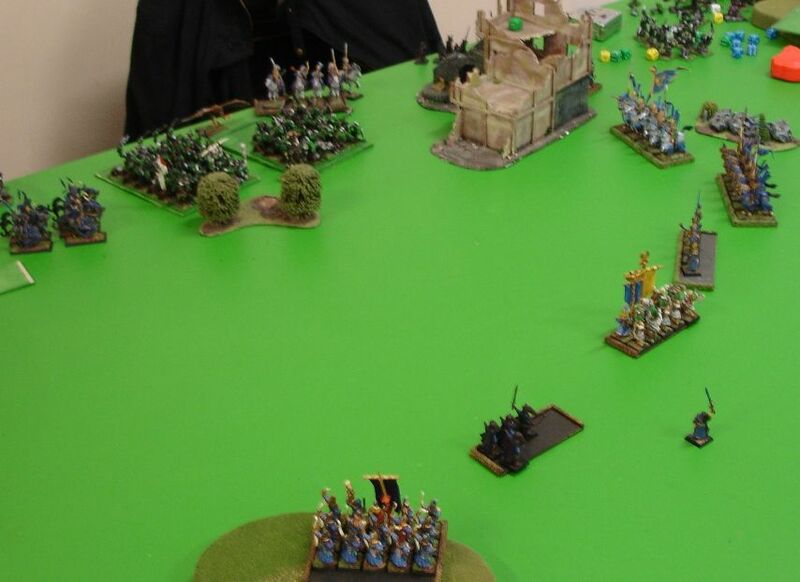 I was also very happy to have the opportunity to charge black orcs from both directions. 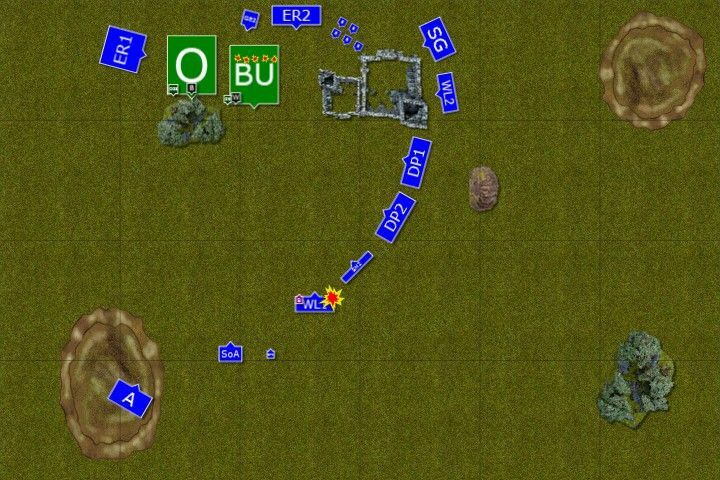 It was a tiny mistake by Chris who left that option open for me when it was possible to reform the unit and deny the flank charge. 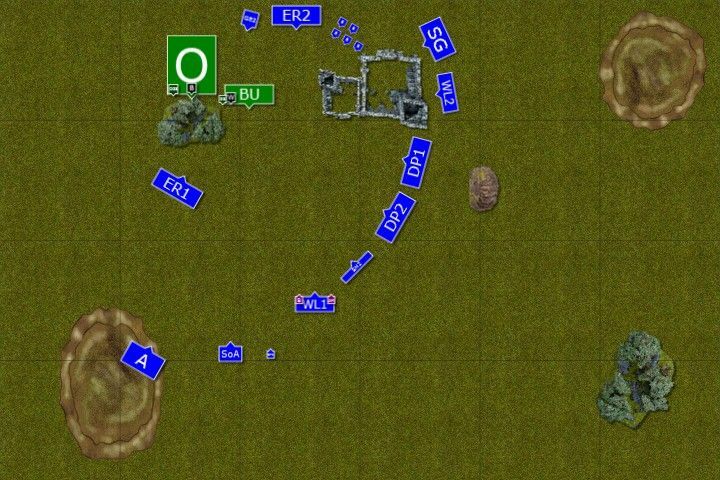 I wanted to get Dragon Princes there but I didn't measure the distance between the building and the rocks and I positioned the unit in a wrong way so that they could not complete the charge. At the same time I am fully aware that the magic could be far more devastating. I was lucky that Foot of Gork didn't stomp all my units and after first one I even got to position it over one of enemy units. I chose Arrer Boyz as I thought I could panic them. Maybe it was better idea to put it on one of the big units? There were of course things I could have done better. First of all I think I was to cautious on the West. 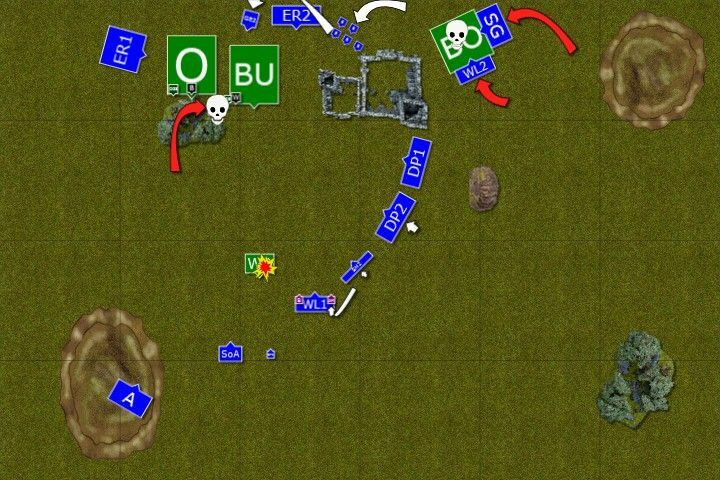 Even when I had to deploy majority of the army in the center I didn't exploit the fact I cleared out the flank with shooting. During the game I was concerned with the fact I could be charged by those big units. But in fact that would be a very good thing as if Chris decided to do so I could use it to pull them out from the nice defensive formation they kept for whole game. Another thing is that I kept Loremaster in the range of the 'Eadbutt. With two spells I could not let through I simply played to my foe hands. Of course with the random distance it was never really out of range but forcing Chris to cast it with more dice to have a boosted version can be a good idea too. I was not rolling well for dispel attempts and that didn't help either. Offensively Loremaster was very good. I tried to cast magic missiles and sometimes I even got them so it was not a killer in itself but helped to kill the trolls faster. Iceshard Blizzard on the lobber helped to draw some dispel dice too. I also liked the ability to cast Spirit Leach but with Ld10 all around it was quite hard to get it working even if it was in. But as I said I am happy with a victory and the fact we had a very good game.